Got my bagel fix on Sunday at the new Tavalin shop, about 20 meters from the old one, just down that alley beside Revolution Bar. This place offers the same bagel choices, quality and prices as before but now has a three-table deck a nice distance from the street on which to enjoy them. You can get a buttered bagel and a coffee — and chill out — for rmb22. Meanwhile, around the corner in the former Tavalin space, Andy’s Craft Sausages has opened. It has a similar seating setup as last year. 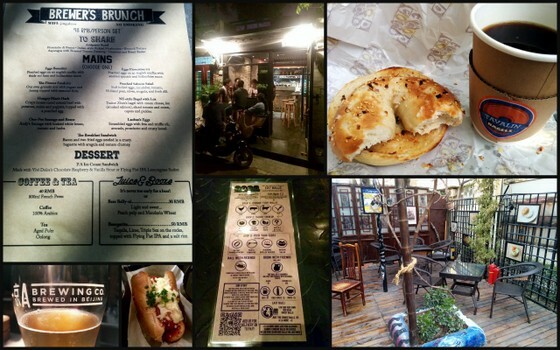 Over in Sanlitun South, Jing-A Taproom has added a brunch option and more outdoor seating. For rmb98, get antipasto, a choice of one of nine mains, ranging from Eggs Benedict to “Hungry Man’s Hash”, and a dessert. Also, all beers are rmb10 off on Sunday. Look for Infusion Bar to open in this part of town in mid-May and include some very creative cocktails on the menu. Finally, The Meatball Company has opened in the Gulou area, near 4corners. I haven’t been yet but the meatball sub above looks fantastic (Meatball Company pics courtesy of Justin C). A man and a duck walk into a bar.